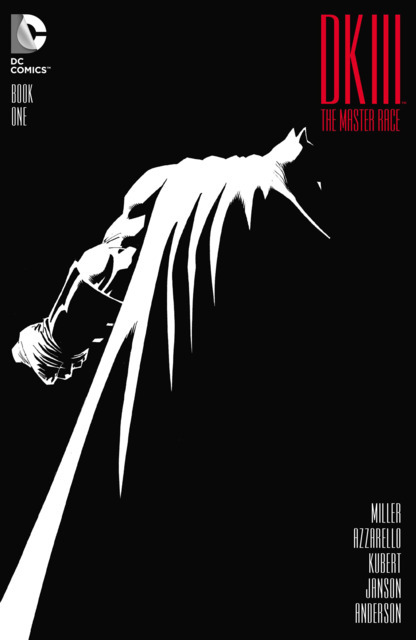 The third, and final installment of Frank Miller’s Dark Knight saga finally arrived yesterday. The news of even having a third sequel to The Dark Knight Returns may have had you a little worried. You may even still be worried. I know when I heard the announcement, my immediate reaction was ” Why? Just let The Dark Knight Returns live on it’s own! Stop ruining your legacy Frank!” The reason for such a contemptuous response is due to Frank Miller’s awful sequel ” The Dark Knight Strikes Again”. A story that was, pretty much universally panned. Not to mention the lazy and uninspired art to go with it. Ths third time around things are a bit different. There is a lot of setup and mystery in this first issue. The time line seems to be about 3 years after “Dark Knight Strikes Again. After not being sighted for said years, Batman is spotted, which sparks a media frenzy. Everyone has an opinion on what to do or think about Batman’s return.”Much like, ” The Dark Knight Returns”, it seems that the media will be playing a key factor in regards to the storytelling. This comic is clearly trying to establish itself in our current time. The media characterizations reflect that. They are all parodies, mind you, but if you look closely you’ll find versions of Jon Stewart, Bill O’Reilly & Kelly Ripa and Michael Strahan to name a few. It was sort of refreshing when I read it to say…” Hey! I know those people.” Azzarello’s strength for believable dialogue is on full display here. Much of the first half of the comic employs cell phone texts that may be difficult to read at times, but are, nevertheless, still effective. It’s a fast paced first issue that spends a bit more time on action rather than characterization. It gives you just enough information to advance to the climax. And what a climax it is. A major game changing moment occurs at the very end of issue one. It’s a great cliffhanger that leaves some burning questions. Issue #1 includes a mini comic featuring The Atom, written and drawn by Frank Miller. in the print version, it’s square in the middle of the book. READ AFTER COMPLETING THE MAIN STORY. Major spoilers if this advice is not heeded. Andy Kubert does a good job on pencils. They are slick and dynamic. He pays a heavy tribute to Frank Miller’s style. He’s clearly emulating the look but not in a gratuitous way. Kubert’s art style still shines through. Klaus Janson is as clinical as ever. He always manages to improve upon any artist that comes his way. He did with Frank Miller in 80’s and this time is no different. One of my favorite inkers of all time for good reason. The action sequences are the highlight of the art. They are exciting and eye catching. You want to study every panel to see if you catch a glimpse of anything extra. One particular fight scene comes to mind. Batman’s shadowy look is used to full effect. The first issue manages to meet my expectations. A solid start that delivers some cool action and some great art. The story seeds have been planted, and they seem interesting enough. After the cliffhanger in issue #1, I expect the story to get even more interesting. The Atom mini comic also manages to add depth and merit the extra price tag on the book overall. Hey Val – didn’t even know this one was coming. Loved the original (of course) so I hope that this one is good too! Hey! Yeah I hope it’s as good as it’s leading up to. Dark Knight Returns has a special place in my heart as well.